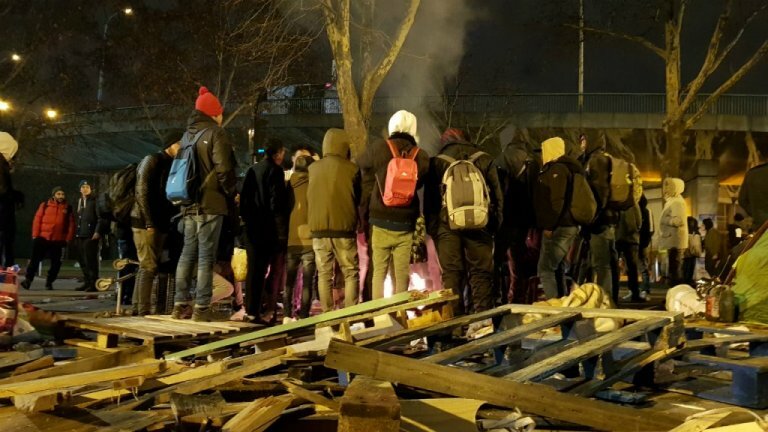 Over the last 10 days, in four separate operations, French police have demolished make-shift migrant camps in northern Paris; the operations, say the city authorities, are part of their efforts to bring everyone indoors during the coldest months of the year. But some 800 migrants are thought to still be sleeping rough on the streets and many people are being missed, or ejected by the system. Between January 22 and January 31, French police evacuated some 1,000 migrants living in four make-shift camps in northern Paris: Porte de Clignancourt, Avenue Wilson, Porte de la Chapelle and La Villette. According to MSF (Doctors Without Borders), around 800 migrants are currently estimated to be living on the streets. The first group of people belonging to these non-sheltered migrants are the ones who had either left the camps, or were temporarily away from the camping grounds when police conducted their operations. “It’s important to note that in the evacuation of La Chapelle camp on January 29, for example, the buses bringing them to the shelters arrived fairly late, at around 8.30am. A lot of the migrants have medical or administrative appointments to attend, and they simply can’t afford to miss them. And so they missed the opportunity to get sheltered,” Louis Barda, coordinator of MSF’s medical access program in Paris, explained. The second group of people are the migrants who were present during the evacuations but who didn’t want to board the buses. “Often this is due to problems linked to their administrative status. Because they are afraid. Some of them have had their asylum applications rejected, or fall under the Dublin agreement , and so they don’t want to attract attention to themselves and prefer to stay on the streets,” Barda continued. There are also another group of migrants: Those who actually boarded the buses and were brought to the temporary indoor shelters, but who ended up on the streets again just a few days, or a few hours, later anyway. “Once they arrive at the shelter where they are supposed to be taken in and accommodated, Ofii agents (the French Office for Immigration and Integration) evaluate their administrative situation. That’s when those who’ve been refused asylum, or those who fall under the Dublin agreement, or even those who’ve been handed refugee status, are told to leave because the emergency accommodation places are primarily reserved for asylum seekers,” Louis Barda said. “Before, everyone would come running when police organized these types of shelter operations because there was a principal of the special winter accommodation not being linked to any conditions. It’s not like that anymore,” he said. The migrants hit the hardest by these conditions are those who fall under the Dublin agreement. According to Antoine Decourcelle, head of migrant aid group La Cimade’s asylum commission in the Ile-de-France region, the French government “is conducting a war without mercy against this group”. And what’s even worse, he said, is that even those who no longer fall under the Dublin agreement and are therefore eligible to file a new asylum application in France after a few months, are excluded. “Ofii simply refuses to take them in,” he said. According to Antoine Decourcelle, this type of sifting began this summer, in accordance with an internal government memo outlining new instructions on how to evaluate the migrants. In December, La Cimade challenged this memo in court. “The document encourages Ofii agents to refuse asylum seekers benefits, including accommodation,” he said. Because of this situation, more and more migrants are now choosing to live on the streets of Paris, steering clear of the camps – and therefore authorities - to stay as invisible as possible. “Near Porte d’Aubervillier (in northern Paris), we just met two Somalis who are on the streets begging and who are steering clear of the camps because they fall under the Dublin agreement. They know that they have one and a half years to go before the Dublin agreement doesn’t apply to them anymore and after which they’ll be able to file for asylum again. And so until then they try to stay out of sight as much as possible, but it also means they fall totally outside the system of getting any help,” MSF’s Louis Barda noted. The associations say these migrants, who are isolated and on the wrong side of the system, are therefore very difficult to number, because they move around and are spread out pretty much everywhere. Aside from those who fall under the Dublin agreement, there are also those who fear for their security in the camps themselves, and who prefer to hide out in micro-camps instead. Others manage to find a roof over their heads thanks to the generosity of ordinary French people who open up their homes to them. 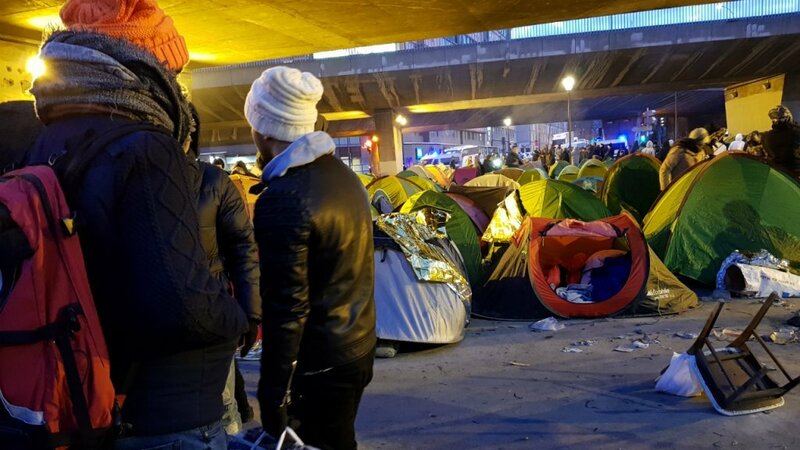 InfoMigrants contacted authorities several days ago to confirm the number of migrants currently sleeping rough in Paris and to get more details on the next evacuation operations that have been planned, but has yet to receive a response.